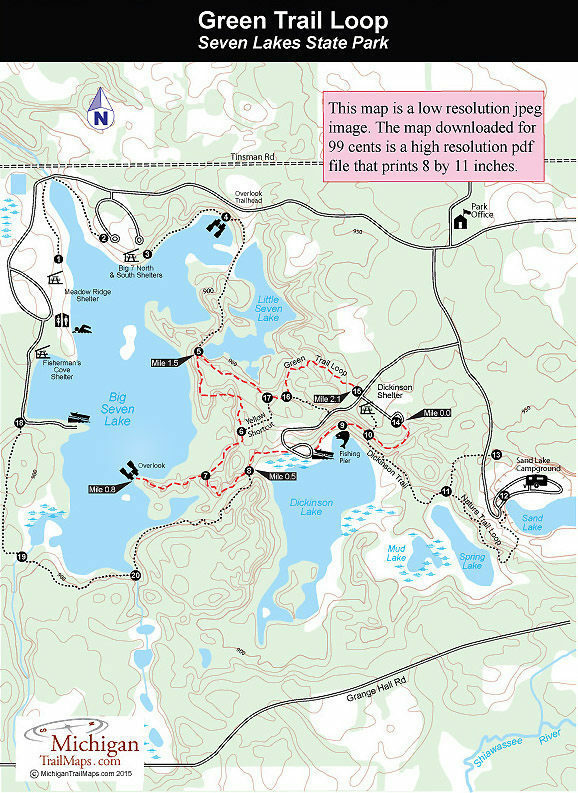 The Green Trail Loop is the most interesting route at Seven Lakes State Park as it winds through mature hardwoods forest, skirts the largest lakes in the park and has enough rolling terrain to keep you on your toes, whether you’re hiking or biking. The park lists it as 2.1 miles in length but we included the Overlook spur, a walk of 2.25 miles. Either way if that’s too short, you can easily combine it with the Dickinson/Nature Trail Loop that would make for a 3.3-mile outing that passes five of the park’s seven lakes. The Yellow Shortcut will shorten the trail to 1.75 miles including the Overlook. You can pick up the Green Trail Loop at either the Dickinson Shelter and picnic area or the boat launch on Dickinson Lake. Both have parking but neither has a source of drinking water. At the east end of the Dickinson shelter parking lot is post No. 14, marking where the path re-enters the woods. Pick up the trail here and within a 100 yards you’ll descend to post No. 10 for your first view of Dickinson Lake. The post marks the junction with the Dickinson Trail that heads south, reaching Spring Lake in less than a quarter mile and the campground in a half mile. To north is a set of log steps that lead back to the picnic area. Two trails depart to the west and both end up at the handicapped-accessible fishing pier where often on summer weekends there are children trying to entice small panfish with worms and crickets. A paved path departs from the fishing pier and in a quarter mile from the start you cross the Dickinson Lake boat launch picking up the trail on its west side where it appears as a mowed lane. You skirt the north end of the lake and quickly move into the cool shade of the hardwood forest. Within a quarter mile of the boat launch you arrive at post No. 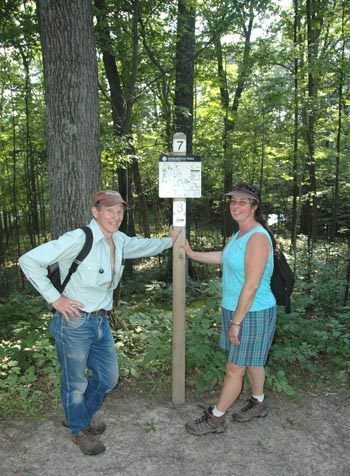 8, marking the junction with the Red Trail Loop from the Big Seven Lake Picnic Area. Head west (right) and you’ll skirt a gurgling stream in a small ravine for a short but scenic stretch that ends at post No. 7, marking the spur to the Overlook. The spur is short and ends on the shoreline of Big Seven Lake, near a small island. You’ve hiked less than a mile at this point yet have gone from lake-to-lake with a scenic stream in between. Returning to post No. 7, you head northeast (left) swing away from views of Big Seven Lake and arrive at post No. 6, marking the junction of the Yellow Shortcut, at Mile 1.27 and at post No. 5, marking a junction with the Red Trail Loop, at Mile 1.5. There is a bench here and in the fall you can sit and gaze at the marshy lower end of Little Seven Lake and the autumn colors that surround you. The trail remains above Little Seven Lake for a spell and then at Mile 1.75 arrives at post No. 17 marking the other end of the Yellow Shortcut. The final leg of the Green Trail Loop includes hiking past a pair of green-carpeted ponds near post No. 16, more rolling terrain and then popping out at post No. 15 along the park road at Mile 2.12. On the other side of the road is the Dickinson Shelter and picnic area just a short walk away.